NHL News : Breaking: The return of the Hartford Whalers! 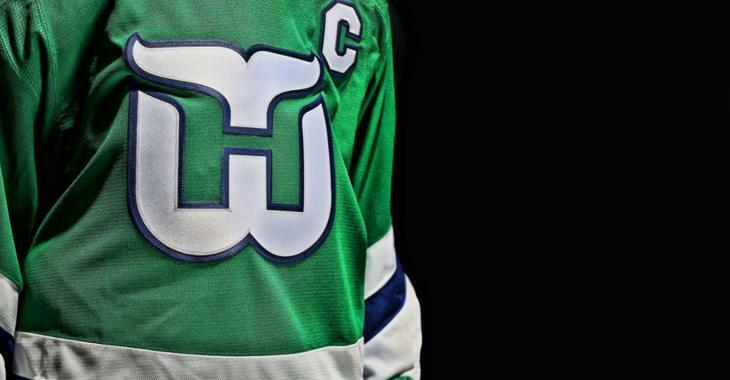 Breaking: The return of the Hartford Whalers! If you could bring back one classic NHL logo and uniform what would it be? Would you go with a defunct team like the Quebec Nordiques, Minnesota North Stars, Hartford Whalers or Colorado Rockies? Or would you elect to go with a vintage look for an existing team like the Pittsburgh Penguins, Vancouver Canucks or Anaheim Ducks? The Hurricanes will throw it back twice in 2018-19 season, wearing the Whalers jerseys on Sunday Dec 23rd against the Boston Bruins and another yet to be announced date. The Carolina Hurricanes will honor their heritage in hosting Whalers Night on Sunday, Dec. 23 when the Boston Bruins, an old Hartford rival, visit PNC Arena. "We're proud of the history and traditions that we've built in 21 years in North Carolina. But we've never thrown away the records established during this franchise's 18 NHL seasons in Connecticut," said Hurricanes President and General Manager Don Waddell. "This is a chance to celebrate our team's heritage and the players and coaches who laid the groundwork for this franchise." Whalers Night will encompass a number of throwback elements, the highlight of which will be the vintage sweaters, sculpted after the threads worn by the Whalers from 1985-89 and 1990-91. The green sweaters feature white and blue striping along the waist, with angled white and blue striping on the arms. The centerpiece is, of course, the iconic Whalers logo. While we love the speed and skill on display in today’s game, we’re suckers for vintage hockey and, in particular, vintage hockey jerseys and logos. There’s no denying to simple beauty of the Whalers jerseys and, like most hockey fans, we can’t wait to see the Whalers take to the ice in the NHL once again. Go, Whalers go!